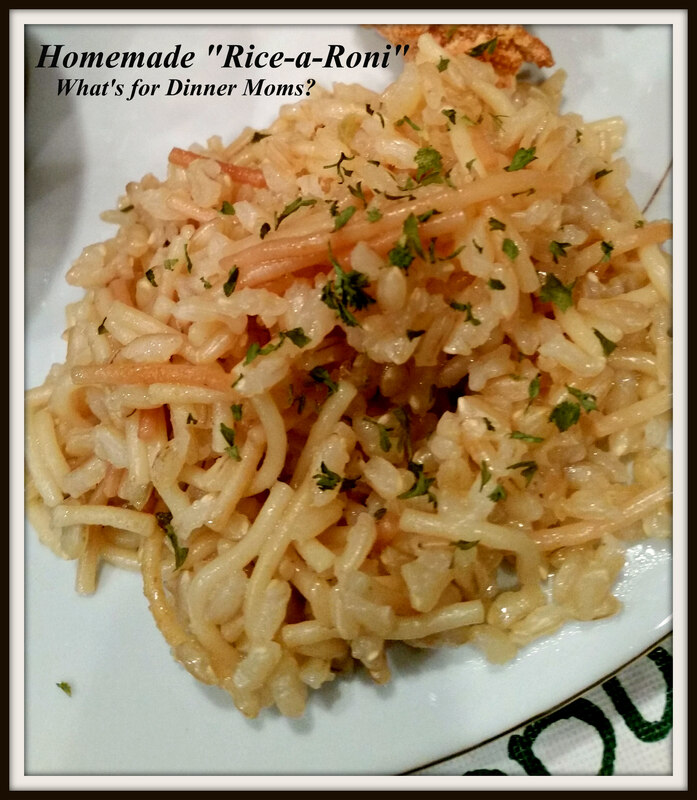 Homemade “Rice-a-Roni” – What's for Dinner Moms? I am always struggling with side dishes for dinner. I have no problem with protein or vegetables but starchy side dishes other mashed potatoes or corn, which my family would happily eat every day, are tough. We do eat sweet potatoes once or twice a week in some form but I need something that is going to fill up a tween boy and not be too unhealthy. When I saw this recipe for Homemade Chicken Rice-a-Roni from Plain Chicken.com (click for link to original recipe) I knew I had to try it. I do not buy boxed or bagged rice or noodle dishes as they are usually too salty and too artificial tasting for my family but I thought I would see if this would help my rice hating daughter eat brown rice. It was a hit. My rice hating daughter ate two servings and said it was not chewy like the rice usually is. I usually cook brown rice in chicken stock but the saltiness, stronger chicken flavor won her over as did the texture of the dish. My son was not a huge fan but ate it anyway. We will be having this dish again! Quick and easy, my two favorite words! In a large skillet over medium-high heat melt the butter. Add the pasta and rice to the skillet and cook until the pasta is turning golden brown. Add the rest of the ingredients to the skillet and bring to a boil. Reduce heat to low and cover the pan. Stir occasionally. Cook for 15-20 minutes until all the water is absorbed and the rice is tender. We love side dishes Marci I have so many recipes for different ones! DO you all like veggies? I am a veggie tolerate. I will eat them well cooked and spiced. This recipe will be tried. My husband likes rice-a-roni but we don’t like the flavor or salt. I like rice; he likes spaghetti. This will be perfect! If you don’t like as much salt look for low sodium bullion for making the dish because it can be salty depending on the brand. What a great idea! I never thought to make my own. I’m excited to try this! I thought the same thing! How come I never thought of this?? I eat rice like everyday (part of my culture). I will definetly need to try this sometime. I wonder if I add like half a habenero if it will ruin the taste? I love spicy foods and so does my husband. Let us know how it works out if you try it! I would love to know.